Heat oven to 325ºF. Grease bottom and sides of 13x9-inch glass baking dish with shortening or spray with cooking spray. In large bowl, beat 4 whole eggs, 1 egg yolk and 3/4 cup sugar with wire whisk until well blended. Beat in milk, whipping cream, vanilla and 1 teaspoon cinnamon until well blended. Stir in 7 cups of the bread pieces and the raisins. Let stand 20 minutes. Pour into baking dish. Lightly press remaining 3 cups bread pieces on top of mixture in baking dish. In small bowl, stir 2 tablespoons sugar and 1/2 teaspoon cinnamon until well blended. Brush top of bread mixture with melted 2 tablespoons butter; sprinkle with cinnamon-sugar. Bake uncovered 55 to 65 minutes or until top is puffed and light golden brown (centre will jiggle slightly). Cool 30 minutes. Meanwhile, in 1-quart saucepan, melt 1/2 cup butter over low heat; do not allow to simmer. Remove from heat; cool 10 minutes. Mix water and 1 egg in small bowl; stir into butter until blended. Stir in 1 cup sugar. Cook over medium-low heat, stirring constantly, until sugar is dissolved and mixture begins to boil; remove from heat. Stir in whiskey. Cool at least 10 minutes before serving. 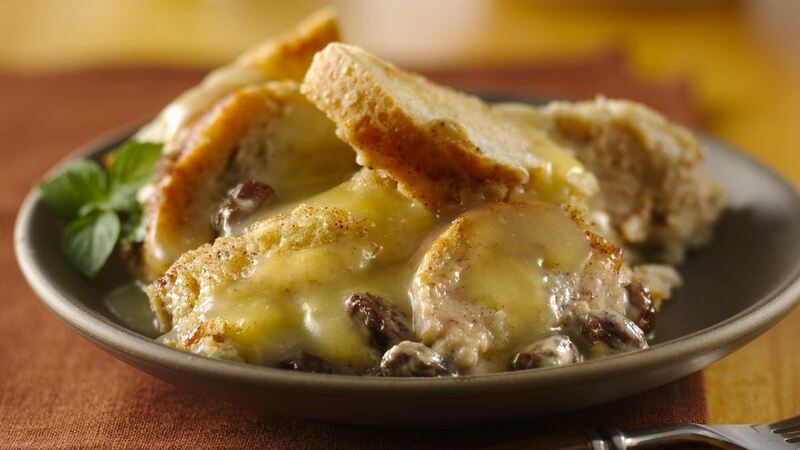 Serve sauce over warm bread pudding. Store remaining dessert and sauce covered in refrigerator. Success: Firm breads make the best bread pudding because the cut pieces hold up to all of the liquid ingredients without becoming mushy. Although firm bread is best, avoid artisan or rustic breads with a very crisp or hard crust.